Following on from our higher specification Mitsubishi Triton versus Isuzu D-Max review a few weeks back, and a similar Navara versus Volkswagen Amarok test earlier this week, we’ve decided to take a closer look at two options further down the pricing chain. This time it’s the new kid on the block, the 2015 Nissan Navara, up against an almost-as-new kid on the block, the 2015 Mitsubishi Triton – in second-from-entry-level 4WD trim. While higher specified 4WD dual cabs are the weapon of choice for the buyer with a family or those wanting the requisite street presence that comes along with it, there are plenty of workers, tradies and business owners who need a more sparsely equipped workhorse – a workhorse that needs to be comfortable, reliable and tough enough to take a genuine beating. Closely matched, this promises to be an interesting comparison. 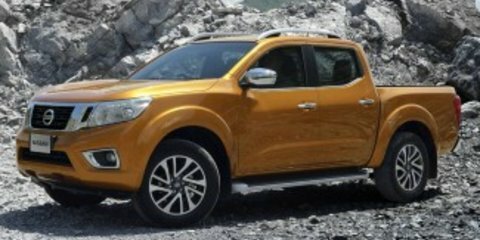 The Triton remains a segment favourite for its value and toughness and has been heavily revised recently, while the Navara is also an all-new model. Crucially, Navara is the first mainstream offering to go with a coil spring suspension setup at the rear for all dual-cab variants. Remember the SsangYong Actyon Sports? Don’t worry. Few do. But that model illustrated the value of coil springs from a daily driving perspective, though sadly not enough people bought them to showcase it to a wider audience. That factor alone promises to be the most visible difference between two dual-cabs that are otherwise very closely aligned. First up, you can read our detailed Nissan Navara pricing and specification guide here, and our detailed Mitsubishi Triton pricing and specification guide here. This test pits two of the more affordable offerings against each other. The Nissan Navara RX Dual Cab 4×4 is the base variant of its range, while the Mitsubishi Triton GLS Double Cab 4×4 is the mid-level variant, given there’s a base GLX beneath it. The Navara starts from $42,490 plus on-road costs as tested with a seven-speed automatic transmission (the manual version is $39,990) and our test vehicle had no options fitted. In RX guise, the Navara weighs 1865kg with the automatic transmission. It has a braked towing capacity of 3500kg, which will appeal to buyers needing to tow often. The tray measures 1503mm long, 1560mm wide and the width between the wheel arches is 1130mm. Navara RX gets an impressive 1028kg payload despite the fitment of the aforementioned springs. The standard features list is basic at this end of the dual cab spectrum, despite the fact that prices in the early 40 grand range aren’t exactly cheap. Our Navara rolls on 16-inch steel wheels shod with 205/R16C light truck tyres. There are two headrests in the second row and cloth trim. There’s Bluetooth phone connectivity and steering wheel mounted controls, a manual tilt-adjustable steering column and rear air vents. Navara RX doesn’t get a reversing camera or rear parking sensors, but it does get a full suite of driver safety aids. There’s no Hill Start Assist or Hill Descent Control and serious off-roaders should note that there is no rear diff lock either. Pricing for the Triton starts from $43,490 with the automatic transmission as tested here. The GLX auto can be had for $39,490. Our test rig wasn’t heavily optioned but the following boxes were ticked: prestige paint ($550), tow kit ($847), tub liner ($453.75) and the soft tonneau cover ($561). That means the final as-tested price, not including the raft of dealer charges, was $45,901. The Triton GLS Double Cab weighs 1950kg for both auto and manual while the braked towing capacity is 3100kg (400kg less than the class-leaders, Navara included). The tray measures 1520mm long, 1470mm wide and there’s 1085mm between the wheel arches. The Triton’s payload is 950kg, giving a 78kg head-start to the Navara. The Triton is shod with 17-inch alloy wheels and 245/65/R17 tyres, reflecting its mid-level spec. It also gets three headrests in the second row and cloth trim. There is Bluetooth phone connectivity and audio streaming with voice control. The Triton trumps the Navara heavily in regard to infotainment thanks to its 6.1-inch colour touchscreen (the RX Navara doesn’t get the 7.0-inch screen of its higher-specced brethren). The Triton doesn’t get rear air vents, though it does get a reverse-view camera. Both dual-cabs offer generally comparable driver position comfort (though taller drivers will prefer the Triton, given only it offers reach-adjustable steering) visibility and ergonomics for driver and passengers, but the more sculpted seats in the Navara are the clear comfort winners. That said, the Triton clearly has better infotainment. There’s little to split the second row, but the Triton does feel as if it has slightly more room in general. The cabin seems wider in the second row and there’s more than enough legroom for adults. Put three blokes across that second row in either vehicle, and it starts to get uncomfortable. Both vehicles have comfortable backrests that show the changes that have been made to dual cab design in the past decade or so. Visibility around town is excellent behind the wheel of both vehicles. Both have that hefty feeling and slow steering we’ve come to expect from dual-cab utes though, and it’s a shame the Triton’s steering isn’t better, considering Mitsubishi spent time on that in development. It’s better than the outgoing model, but not as good as we’d like. The Navara is likewise ponderous and you’ll find there will be more turns, lock-to-lock, needed than you’d like – especially if you’re in tight confines. Reversing into the loading bays at the landscape supply yard for our photoshoot, it was obvious that both dual-cabs require some work behind the wheel. Strangely, the Triton used to be the only dual-cab available with an electric rear windscreen. Mitsubishi decided to delete that at the same time as Nissan decided to introduce it. So now, Navara is the only dual cab with said electric rear windscreen. The Navara’s slides across rather than the outgoing Triton’s which used to drop down. It’s a feature some will love and others won’t care for, but it does mean your dog can poke its head through the aperture and slobber into the cabin when you’re running round town. Storage is extensive for both vehicles too, although if you use the second row often, the strangely positioned cup/bottle holder in the centre of the floor will be a Navara annoyance. It works well enough, but its positioning leaves a bit to be desired. Crucially, neither Navara nor Triton feel like they’ve been designed and thrown together down to a price like commercial dual-cabs used to. There’s ample phone and wallet storage, cupholders and bottle holders. The Triton gets proper ISOFIX mountings, but the Navara gets the much more old school, and in our opinion less safe, top-tether style mountings. Infotainment? What infotainment? That seems to be Nissan’s thought process with this specification level for Navara (pictured above). Steering-wheel-mounted controls direct major functions, but the Navara’s basic system is – for those who place importance on it – a clear loser to the Triton’s system. Sound clarity, Bluetooth functionality and menu operation are all reliable and clear, but there’s no hiding from the fact the Navara’s system is a generation old at this end of the model range. The Triton (above), on the other hand, gets a crisp 6.1-inch colour touchscreen, which is a big step forward from the outgoing model. Like the Navara, the Triton’s main systems work clearly and concisely, but the large screen makes the whole interior feel more current and fresh. Triton also has steering wheel mounted controls, which make general functionality a breeze. The lower specification models in the Navara range don’t get the same powerful twin-turbo diesel engine as that sitting under the bonnet of the higher-specified models we’ve tested. As such, our test Navara is powered by the 2.3-litre four-cylinder single-turbo-diesel engine, which generates 120kW at 3750rpm and 403Nm between 1500 and 2500rpm. The engine is backed by an optional seven-speed automatic transmission and has dual-range 4WD with electronic 4WD selection. Navara has an 80-litre fuel tank and the ADR fuel claim is 7.1 litres/100km. On test with an equal mix of urban and highway running, the Navara returned an indicated 8.3L/100km. The Triton, on the other hand, maintains the same engine across the range, meaning buyers at this end of the scale don’t miss out in power and torque terms. The 2.5-litre four-cylinder turbo diesel engine churns out 133kW at 3500rpm and 430Nm at 2500rpm. Those figures trump the Navara’s outputs by enough to notice anytime you need to coax the Triton up to speed with some enthusiasm. The Navara doesn’t feel overly stressed, but the Triton feels effortless. Oddly, as mentioned earlier, Nissan still claims the higher towing capacity by 400kg. Triton makes do with a five-speed automatic transmission and also has dual-range 4WD and electronic 4WD selection. The fuel tank holds 75 litres and the ADR claim is 7.6 litres/100km. Over the same course as the Navara, the Triton returned an indicated 8.8L/100km. While the power disparity isn’t glaringly noticeable on the road unladen, the Navara starts to show its shortfall when you load the tray up. The single turbo Nissan oiler is, in general terms, nowhere near as engaging or enjoyable as the more powerful twin-turbo variant. Neither engine is especially noisy or harsh, although the Triton is more refined and quieter from inside the cabin – there’s a tangible improvement to interior ambience, which backs up the effort Mitsubishi has put into the new Triton’s insulation. We wanted to conduct this test as close to the real world as possible, so we came up with the idea of loading the trays up to better replicate what owners would be doing on job sites and in factories all around Australia. Some genius – Matt Campbell – suggested a local landscape supplies company. I say genius because that suggestion meant one of two things: shoveling out a heap of dirt or gravel by hand, or loading some heavy weight into the tray. The bags of gravel we used were the lesser (albeit heavier) of two evils. We used the same 20 bags of ornamental rock for each vehicle, with each bag weighing at least 20kg, giving us a total somewhere north of 400kg. Granted, it isn’t a weight that is likely to overly stress either dual cab, but it’s a good indication of what many owners will lug around every day. The guys at Lower Mountains Landscape Supplies were fantastic in assisting us with this test and they let us take over their stock yard for half the day. If you need any garden supplies in the Blue Mountains or Penrith regions, check out their website if you need anything around the home. So, we had the weight sorted, but plenty of dual-cabs spend their time unladen too. First up, then, we headed for a corrugated, coarse chip road loop with no weight in the tray and two people on board. You’d expect the all-new Navara to ride better without any weight in the tray given its coil spring rear end, and you’d be right. There’s a discernible difference on road between the two. On the highway run out to the landscape supplies centre, both dual-cabs performed similarly, given the smoothness of the road surface. It’s when the road starts to get poor that the coil spring system comes into its own. The coarse chip, rutted surface highlights the more composed nature of the Navara. It irons out high frequency bumps easier, it soaks up the sharper edges of potholes more competently and it tackles nasty traffic islands with aplomb. The Triton, however, exhibits the classical traits of a leaf spring rear axle that is designed primarily to haul big weight around. It skips and hustles over bumps, feels generally stiffer and more harsh and is less composed through corners when bumps upset the general balance. Our drive loop never exceeded 70km/h and yet, the Navara was clearly more competent. 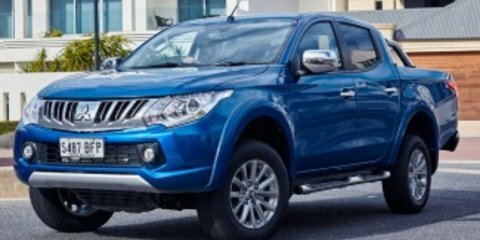 Of particular interest to us on road, was the fact that the Navara uses 16-inch light truck tyres on steel wheels against the Triton’s 17-inch road focused rubber and alloy wheels. Despite the disparity in rolling stock, the Navara never feels uncertain or wallowy. You’d expect the Triton to perform slightly better if you push a little harder, lift the speed through corners or need to trudge through prolonged heavy rain. After assembling the 400+kg of gravel bags into the tray of each vehicle (we used the same 20 bags for exact weight in both trays) we then headed back out to tackle the identical road loop. First up, you can see in the photos the amount of visible sag in the Navara’s suspension with the weight loaded in. You could notice the nose-up stance from behind the wheel too. Once we got out onto the road, the steering never felt light or floaty in either dual cab, but both made you acutely aware of the weight especially accelerating from standstill. You could hear and feel the engines working harder in both vehicles. The Triton might have had a very marginal edge in that regard, although the difference wasn’t stark. What surprised us the most was the Navara once again clearly excelling in terms of ride comfort and bump absorption even with the weight in the tray. Despite the softer, more comfortable unladen ride courtesy of the coil springs, the Navara once again rode better, handled better and soaked up all manner of bumps and ruts more competently than the leaf sprung Triton. Granted, 400kg is nowhere near the payload limit of either dual cab and we’d be interested to see if the Navara can maintain that composure right up to its payload limit. With 400+kg in the tray though, the Navara was clearly the better of the two on this test. The new Navara is covered by a three-year, 100,000km warranty and three years of 24-hour roadside assistance. The myNissan service certainty plan covers the first six services up to 120,000km. In total, those services add up to $3596 for the first 120,000km. Triton is covered by Mitsubishi’s five-year, 100,000km warranty and if you service your vehicle at an authorised Mitsubishi dealer, you’ll get the same period of 24-hour roadside assistance. Mitsubishi capped-price plan covers four services up to 60,000km. In total, the first 60,000km will cost you $2090. So close is this test, it’s hard to pick an outright winner. The question that potential Navara buyers have been asking CarAdvice is whether the coil spring rear end can stand up to lengthy abuse and heavy weights over time. Our 400+kg test proved the Navara could carry that much weight and still maintain composure, but load it right up to its payload limit and the result might be a little different. It would be fair to assume, though, that Nissan hasn’t sent the new Navara to market with a coil spring system that hasn’t been extensively tested – and abused – to ensure it’s durable enough to tackle the daily grind. Where the Navara does let itself down is in terms of interior tech and inclusions. Despite being more comfortable than the Triton, it still feels like a decidedly more basic cabin. That’s because, unlike the better-value Triton range, the RX’s price point also represents the range entry point. The Triton feels (like it always has) as tough as nails and durable as always, and as usual the styling continues to polarise. The Triton’s engine is marginally more effortless than the Nissan, so that’s a factor to take into consideration if you haul weight around often. If it were my money on the line, I’d buy the Navara. I’d rarely need to carry more than 400kg and I’d appreciate the more comfortable seats over the Mitsubishi’s superior infotainment. I also think anyone who has to drive a dual-cab unladen more often than not will appreciate the significantly more composed road holding and bump absorption of the Navara. Day to day, it makes a big difference. It’s a close thing though, and I can also see the strong points of the Triton. This pair is pretty hard to split.